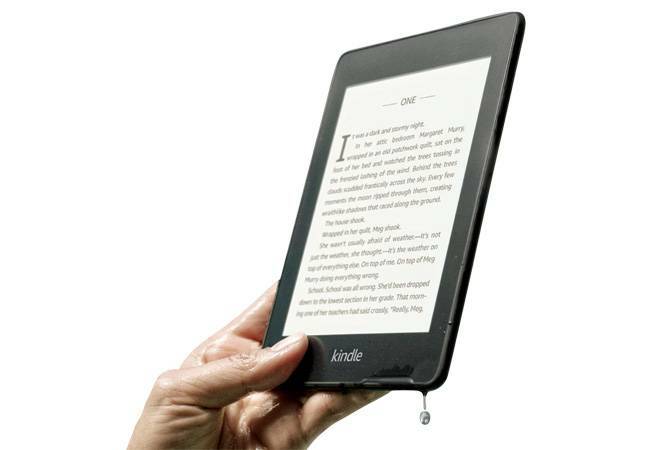 The 10th edition of the popular e-book reader checks all the right boxes - it looks good and boasts several good features. With a thickness of 8.2 mm, this device feels sleek, is lightweight (182g) and boasts an ergonomic design with the 6-inch e-ink touch display blending seamlessly into the thick side bezels and giving it a perfect grip. The wake button and the charging port are at the bottom panel while the side panels and the rear have a rubberised soft finish. Best of all, the device is waterproof and comes with an IPX8 rating, which means it can withstand an accidental dip up to 60 minutes in 2m deep water. Setting up the e-book reader is easy. Just connect it to the Wi-Fi network (my review unit was the Wi-Fi only variant) and log in using your Amazon account. The home page is neat and well-organised. The row on the top includes all necessary icons - home, back, settings, Goodreads, store and search. These came in handy as I was able to adjust brightness, change reading options and turn the background from white to black. The homepage also features more sections - a library containing purchased and downloaded books, new & notable in Prime reading (free and unlimited access to a selection of books if you have an Amazon Prime membership), recommendations, bestsellers in Kindle Store and new releases. Also, the device quickly downloaded books from the server and added them to the library. I was also able to increase/decrease the font size by pinching in/out using two fingers and the Kindle instantly auto-fitted the text. Moreover, I could resume my reading from where I left off whenever I opened a book. And this holds good for any book I had opened in the past. The device has plenty of additional features such as looking up a word, highlighting text, creating a note, sharing and more. Overall, images and text appear sharp on the 300 ppi screen. Then there are five built-in LEDs to enable reading in the dark. The screen is glare-free and quite comfortable to peruse even under harsh lighting. Unlike tablets and mobile phones, the e-ink display does not strain your eyes and one can easily read for long hours. Even the battery life is impressive as a single charge lasted me long enough to finish a 500-plus-page book with still some juice left. Although nothing can replace the good old feeling of holding a printed book and turning its pages, this e-reader is convenient as I was able to download new titles and old collections quickly, in real time. Plus, the 8 GB internal memory is good enough to store thousands of books.